Warning: Models are often selected to calculate credits. The model selected depends on your objectives. For compliance with the Construction Stormwater permit, the model must be based on the assumption that an instantaneous volume is captured by the BMP. Recommended pollutant removal efficiencies, in percent, for infiltration BMPs. Sources. meeting or complying with water quality objectives, including Total Maximum Daily Load (TMDL) Wasteload Allocations (WLAs). This page provides a discussion of how infiltration practices can achieve stormwater credits. Infiltration practices include infiltration basins, infiltration trenches (including dry wells), and underground infiltration systems. The discussion does not include bioinfiltration and permeable pavement systems, unless specifically mentioned. To view the credit articles for other BMPs, see the Related pages section. Schematic showing an infiltration basin. Note that inflow into the practice has undergone pretreatment. Once the infiltration basin is filled, water bypasses rather than enters the practice. Infiltration practices are designed to capture, store, and infiltrate stormwater runoff. They rely on naturally permeable soils to fully infiltrate the designed water quality volume (VWQ). These are typically off-line practices utilizing an emergency spillway or outlet structure to capture the volume of stormwater runoff for which the practice is designed. Volumes that exceed the rate or volume of the infiltration practice are allowed to bypass the BMP. 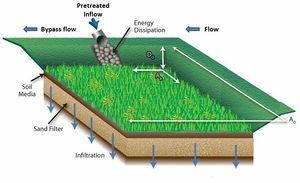 Infiltration practices reduce stormwater volume and pollutant loads through infiltration of the stormwater runoff into the native soil. Infiltration practices also can remove a wide variety of stormwater pollutants through secondary removal mechanisms including filtration, biological uptake, and soil adsorption through plantings and soil media (WEF Design of Urban Stormwater Controls, 2012). See Other Pollutants, for a complete list of other pollutants addressed by infiltration practices. Stormwater Treatment Trains are comprised of multiple Best Management Practices that work together to minimize the volume of stormwater runoff, remove pollutants, and reduce the rate of stormwater runoff being discharged to Minnesota wetlands, lakes and streams. Because infiltration practices are designed to be off-line, they may either be located at the end of the treatment train, or used as off-line configurations to divert the water quality volume from the on-line system. This section describes the basic concepts and equations used to calculate credits for volume, Total Suspended Solids (TSS) and Total Phosphorus (TP). Specific methods for calculating credits are discussed later in this article. Infiltration practices are also effective at reducing concentrations of other pollutants including nitrogen, metals, bacteria, and hydrocarbons. This article does not provide information on calculating credits for pollutants other than TSS and TP, but references are provided that may be useful for calculating credits for other pollutants. In developing the credit calculations, it is assumed the infiltration practice is properly designed, constructed, and maintained in accordance with the Minnesota Stormwater Manual. If any of these assumptions is not valid, the BMP may not qualify for credits or credits should be reduced based on reduced ability of the BMP to achieve volume or pollutant reductions. For guidance on design, construction, and maintenance, see the appropriate article within the infiltration basin or infiltration trench sections of the Manual. Because of their high susceptibility of failure due to clogging, pretreatment is REQUIRED in all infiltration designs. In the following discussion, the water quality volume (VWQ) is delivered instantaneously to the BMP. VWQ is stored as water ponded above the soil or engineered media and below the overflow elevation. VWQ can vary depending on the stormwater management objective(s). For construction stormwater, VWQ is 1 inch off new impervious surface. For MIDS, VWQ is 1.1 inches. In reality, some water will infiltrate through the bottom and sidewalls of the BMP as a rain event proceeds. The instantaneous volume method therefore may underestimate actual volume and pollutant losses. Credit calculations presented in this article are for both event and annual volume and pollutant load removals. Stormwater volume credit equates to the volume of runoff that will ultimately be infiltrated into the soil subgrade. TSS and TP credits are achieved for the volume of runoff that is infiltrated. Schematic showing terms used in calculating volume credits for an infiltration basin. Do is the ponded depth with the BMP, in feet. If native soils are used rather than engineered media, the term AM may be substituted by AB, as shown in the above schematic and in the schematics for the MIDS calculator. To comply with the Construction Stormwater General Permit, VWQ must infiltrate within 48 hours (24 hours is recommended if discharges are to a trout stream). Some of the VWQ will be lost to evapotranspiration rather than all being lost to infiltration. In terms of a water quantity credit, this differentiation is unimportant, but it may be important if attempting to calculate actual infiltration into the underlying soil. The annual volume captured and infiltrated by the BMP can be determined with appropriate modeling tools, including the MIDS calculator. Example values are shown below for a scenario using the MIDS calculator. For example, a permeable pavement system designed to capture 1 inch of runoff from impervious surfaces will capture 89 percent of annual runoff from a site with B (SM) soils. Annual volume, expressed as a percent of annual runoff, treated by a BMP as a function of soil and water quality volume. See footnote1 for how these were determined. 1Values were determined using the MIDS calculator. BMPs were sized to exactly meet the water quality volume for a 2 acre site with 1 acre of impervious, 1 acre of forested land, and annual rainfall of 31.9 inches. EMCTSS is the event mean TSS concentration in runoff water entering the BMP (milligrams per liter). Vannual is the annual volume treated by the BMP, in acre-feet. The annual volume captured and infiltrated by the BMP can be determined with appropriate modeling tools, including the MIDS calculator. EMCTP is the event mean TP concentration in runoff water entering the BMP (milligrams per liter). Warning: The model selected depends on your objectives. For compliance with the Construction Stormwater permit, the model must be based on the assumption that an instantaneous volume is captured by the BMP. Users may opt to use a water quality model or calculator to compute volume, TSS and/or TP pollutant removal for the purpose of determining credits for infiltration practices. The available models described in the following sections are commonly used by water resource professionals, but are not explicitly endorsed or required by the Minnesota Pollution Control Agency. Furthermore, many of the models listed below cannot be used to determine compliance with the Construction Stormwater General permit since the permit requires the water quality volume to be calculated as an instantaneous volume. The following table lists water quantity and water quality models that are commonly used by water resource professionals to predict the hydrologic, hydraulic, and/or pollutant removal capabilities of a single or multiple stormwater BMPs. The table can be used to guide a user in selecting the most appropriate model for computing volume, TSS, and/or TP removal for biofiltration BMPs. Sort the table by Infiltrator BMPs to identify BMPs that may include infiltration practices. Comparison of stormwater models and calculators. Additional information and descriptions for some of the models listed in this table can be found at this link. Note that the Construction Stormwater General Permit requires the water quality volume to be calculated as an instantaneous volume, meaning several of these models cannot be used to determine compliance with the permit. Access this table as a Microsoft Word document: File:Stormwater Model and Calculator Comparisons table.docx. Center for Neighborhood Technology Green Values National Stormwater Management Calculator X X X X No No Yes Does not compute volume reduction for some BMPs, including cisterns and tree trenches. CivilStorm Yes Yes Yes CivilStorm has an engineering library with many different types of BMPs to choose from. This list changes as new information becomes available. EPA National Stormwater Calculator X X X No No Yes Primary purpose is to assess reductions in stormwater volume. EPA SWMM X X X Yes Yes Yes User defines parameter that can be used to simulate generalized constituents. HydroCAD X X X No No Yes Will assess hydraulics, volumes, and pollutant loading, but not pollutant reduction. infoSWMM X X X Yes Yes Yes User defines parameter that can be used to simulate generalized constituents. i-Tree-Hydro X No No Yes Includes simple calculator for rain gardens. i-Tree-Streets No No Yes Computes volume reduction for trees, only. LSPC X X X Yes Yes Yes Though developed for HSPF, the USEPA BMP Web Toolkit can be used with LSPC to model structural BMPs such as detention basins, or infiltration BMPs that represent source control facilities, which capture runoff from small impervious areas (e.g., parking lots or rooftops). MapShed X X X X Yes Yes Yes Region-specific input data not available for Minnesota but user can create this data for any region. Metropolitan Council Stormwater Reuse Guide Excel Spreadsheet X No No Yes Computes storage volume for stormwater reuse systems. Uses 30-year precipitation data specific to Twin Cites region of Minnesota. MIDS Calculator X X X X X X Yes Yes Yes Includes user-defined feature that can be used for manufactured devices and other BMPs. MIKE URBAN (SWMM or MOUSE) X X X Yes Yes Yes User defines parameter that can be used to simulate generalized constituents. PCSWMM X X X Yes Yes Yes User defines parameter that can be used to simulate generalized constituents. PLOAD X X X X X Yes Yes No User-defined practices with user-specified removal percentages. PondNet X Yes No Yes Flow and phosphorus routing in pond networks. PondPack X [ No No Yes PondPack can calculate first-flush volume, but does not model pollutants. It can be used to calculate pond infiltration. SELECT X X X X X Yes Yes Yes User defines parameter that can be used to simulate generalized constituents. SWAT X X X Yes Yes Yes Model offers many agricultural BMPs and practices, but limited urban BMPs at this time. Virginia Runoff Reduction Method X X X X X X Yes No Yes Users input Event Mean Concentration (EMC) pollutant removal percentages for manufactured devices. WinHSPF X X X Yes Yes Yes USEPA BMP Web Toolkit available to assist with implementing structural BMPs such as detention basins, or infiltration BMPs that represent source control facilities, which capture runoff from small impervious areas (e.g., parking lots or rooftops). XPSWMM X X X Yes Yes Yes User defines parameter that can be used to simulate generalized constituents. The Simple Method is a technique used for estimating storm pollutant export delivered from urban development sites. Pollutant loads are estimated as the product of mean pollutant concentrations and runoff depths over specified periods of time (usually annual or seasonal). The method was developed to provide an easy yet reasonably accurate means of predicting the change in pollutant loadings in response to development. Ohrel (2000) states: "In general, the Simple Method is most appropriate for small watersheds (<640 acres) and when quick and reasonable stormwater pollutant load estimates are required". Rainfall data, land use (runoff coefficients), land area, and pollutant concentration are needed to use the Simple Method. For more information on the Simple Method, see The Simple method to Calculate Urban Stormwater Loads or The Simple Method for estimating phosphorus export. Some simple stormwater calculators utilize the Simple Method (STEPL, Watershed Treatment Model). The MPCA developed a simple calculator for estimating load reductions for TSS, total phosphorus, and bacteria. Called the MPCA Estimator, this tool was developed specifically for complying with the MS4 General Permit TMDL annual reporting requirement. The MPCA Estimator provides default values for pollutant concentration, runoff coefficients for different land uses, and precipitation, although the user can modify these and is encouraged to do so when local data exist. The user is required to enter area for different land uses and area treated by BMPs within each of the land uses. BMPs include infiltrators (e.g. bioinfiltration, infiltration basin/trench, tree trench, permeable pavement, etc. ), filters (biofiltration, sand filter, green roof), constructed ponds and wetlands, and swales/filters. The MPCA Estimator includes standard removal efficiencies for these BMPs, but the user can modify those values if better data are available. Output from the calculator is given as a load reduction (percent, mass, or number of bacteria) from the original estimated load. Caution: The MPCA Estimator should not be used for modeling a stormwater system or selecting BMPs. Because the MPCA Estimator does not consider BMPs in series, makes simplifying assumptions about runoff and pollutant removal processes, and uses generalized default information, it should only be used for estimating pollutant reductions from an estimated load. It is not intended as a decision-making tool. A quick guide for the estimator is available Quick Guide: MPCA Estimator tab. The Minimal Impact Design Standards (MIDS) best management practice (BMP) calculator is a tool used to determine stormwater runoff volume and pollutant reduction capabilities of various low impact development (LID) BMPs. The MIDS calculator estimates the stormwater runoff volume reductions for various BMPs and annual pollutant load reductions for total phosphorus (including a breakdown between particulate and dissolved phosphorus) and total suspended solids (TSS). The calculator was intended for use on individual development sites, though capable modelers could modify its use for larger applications. The MIDS calculator is designed in Microsoft Excel with a graphical user interface (GUI), packaged as a windows application, used to organize input parameters. The Excel spreadsheet conducts the calculations and stores parameters, while the GUI provides a platform that allows the user to enter data and presents results in a user-friendly manner. Detailed guidance has been developed for all BMPs in the calculator, including infiltration practices. An overview of individual input parameters and workflows is presented in the MIDS Calculator User Documentation. give preference to literature that has been published in a peer-reviewed publication. The following references summarize pollutant reduction values from multiple studies or sources that could be used to determine credits. Users should note that there is a wide range of monitored pollutant removal effectiveness in the literature. Before selecting a literature value, users should compare the characteristics of the monitored site in the literature against the characteristics of the proposed stormwater pond, considering such conditions as watershed characteristics, pond sizing, and climate factors. International Stormwater Best Management Practices (BMP) Database Pollutant Category Summary Statistical Addendum: TSS, Bacteria, Nutrients, and Metals. Compilation of BMP performance studies published through 2011. Applicable to grass strips, bioretention, bioswales, detention basins, green roofs, manufactured devices, media filters, porous pavements, wetland basins, and wetland channels. Effectiveness Evaluation of Best Management Practices for Stormwater Management in Portland, Oregon. Appendix M contains Excel spreadsheet of structural and non-structural BMP performance evaluations. Provides values for sediment, nutrients, pathogens, metals, quantity, air purification, carbon sequestration, flood storage, avian habitat, aquatics habitat and aesthetics. Applicable to Filters, Wet Ponds, Porous Pavements, Soakage Trenches, Flow through Stormwater Planters, Infiltration Stormwater Planters, Vegetated Infiltration Basins, Swales, and Treatment Wetlands. The Illinois Green Infrastructure Study. BMP Performance Analysis. Prepared for US EPA Region 1, Boston MA. Provides values for TP, TSS, and Zn. Pollutant removal broken down according to land use. Applicable to Infiltration Trench, Infiltration Basin, Bioretention, Grass Swale, Wet Pond, and Porous Pavement. Field monitoring may be used to calculate stormwater credits in lieu of desktop calculations or models/calculators as described. Careful planning is HIGHLY RECOMMENDED before commencing a program to monitor the performance of a BMP. The general steps involved in planning and implementing BMP monitoring include the following. Establish the objectives and goals of the monitoring. Which pollutants will be measured? Will the monitoring study the performance of a single BMP or multiple BMPs? Are there any variables that will affect the BMP performance? Variables could include design approaches, maintenance activities, rainfall events, rainfall intensity, etc. Will the results be compared to other BMP performance studies? What should be the duration of the monitoring period? Is there a need to look at the annual performance vs the performance during a single rain event? Is there a need to assess the seasonal variation of BMP performance? The following guidance manuals have been developed to assist BMP owners and operators on how to plan and implement BMP performance monitoring. Investigation into the Feasibility of a National Testing and Evaluation Program for Stormwater Products and Practices. In 2014 the Water Environment Federation released this White Paper that investigates the feasibility of a national program for the testing of stormwater products and practices. The information contained in this White Paper would be of use to those considering the monitoring of a manufactured BMP. The report does not include any specific guidance on the monitoring of a BMP, but it does include a summary of the existing technical evaluation programs that could be consulted for testing results for specific products (see Table 1 on page 8). In addition to TSS and phosphorus, infiltration practices can reduce loading of other pollutants. According to the International Stormwater Database, studies have shown that infiltration practices are effective at reducing concentration of pollutants, including nutrients, metals, bacteria, cyanide, oils and grease, Volatile Organic Compounds (VOC), and Biological Oxygen Demand (BOD). A compilation of the pollutant removal capabilities from a review of literature are summarized below. Relative pollutant reduction from bioretention systems for metals, nitrogen, bacteria, and organics. Bureau of Environmental Services. 2006. Effectiveness Evaluation of Best Management Practices for Stormwater Management in Portland, Oregon. Bureau of Environmental Services, Portland, Oregon. California Stormwater Quality Association. 2003. California Stormwater BMP Handbook-New Development and Redevelopment. California Stormwater Quality Association, Menlo Park, CA. Caltrans. 2004. BMP Retrofit Pilot Program Final Report, Report No. CTSW-RT-01-050. Division of Environmental Analysis. California Dept. of Transportation, Sacramento, CA. CDM Smith. 2012. Omaha Regional Stormwater Design Manual. Chapter 8 Stormwater Best Management Practices. Kansas City, MO. Caraco, Deborah, and Richard A. Claytor. 1997. Stormwater BMP Design: Supplement for Cold Climates. US Environmental Protection Agency. Denr, N. 2007. Stormwater Best Management Practices Manual. North Carolina Department of Environment and Natural Resources, Raleigh, North Carolina. Dorman, M. E., H. Hartigan, F. Johnson, and B. Maestri. 1988. Retention, detention, and overland flow for pollutant removal from highway stormwater runoff: interim guidelines for management measures. Final report, September 1985-June 1987. No. PB-89-133292/XAB. Versar, Inc., Springfield, VA (USA). Geosyntec Consultants and Wright Water Engineers. 2009. Urban Stormwater BMP Performance Monitoring. Prepared under Support from U.S. Environmental Protection Agency, Water Environment Research Foundation, Federal Highway Administration, Environmental and Water Resource Institute of the American Society of Civil Engineers. Gulliver, J. S., A. J. Erickson, and P.T. Weiss. 2010. Stormwater treatment: Assessment and maintenance. University of Minnesota, St. Anthony Falls Laboratory. Minneapolis, MN. Hathaway, J. M., W. F. Hunt, and S. Jadlocki. 2009. Indicator bacteria removal in storm-water best management practices in Charlotte, North Carolina. Journal of Environmental Engineering 135, no. 12: 1275-1285. Jaffe, et. al. 2010. The Illinois Green Infrastructure Study. Prepared by the University of Illinois at Chicago, Chicago Metropolitan Agency for Planning. Center for Neighborhood Technology, Illinois-Indiana Sea Grant College Program. Jurries, Dennis. 2003. Biofilters (Bioswales, Vegetative Buffers, & Constructed Wetlands) for Storm Water Discharge Pollution Removal. Quality, State of Oregon, Department of Environmental Quality (Ed.). Kurz, Raymond C. 1998. Removal of microbial indicators from stormwater using sand filtration, wet detention, and alum treatment: best management practices. PhD diss., University of South Florida. Leisenring, M., J. Clary, and P. Hobson. 2012. International Stormwater Best Management Practices (BMP) Database Pollutant Category Summary Statistical Addendum: TSS, Bacteria, Nutrients, and Metals. Muthukrishnan, Swarna. 2010. Treatment Of Heavy Metals In Stormwater Runoff Using Wet Pond And Wetland Mesocosms. In Proceedings of the Annual International Conference on Soils, Sediments, Water and Energy, vol. 11, no. 1, p.9. New Hampshire Department of Environmental Services. 2008. New Hampshire Stormwater Manual. Volume 2 Appendix B. Concord, NH. Schueler, T.R., Kumble, P.A., and Heraty, M.A. 1992. A Current Assessment of Urban Best Management Practices: Techniques for Reducing Non-Point Source Pollution in the Coastal Zone. Metropolitan Washington Council of Governments, Washington, D.C.
Schueler, Thomas R. 1987. Controlling urban runoff: A practical manual for planning and designing urban BMPs. Washington, DC: Metropolitan Washington Council of Governments. State of California, Department of Transportation. 2013. Caltrans Stormwater Monitoring Guidance Manual. Sacramento, CA. TetraTech. 2008. BMP Performance Analysis. Prepared for US EPA Region 1, Boston, MA. Transportation Research Board. 2006. Evaluation of Best Management Practices for Highway Runoff Control. National Cooperative Highway Research program. Report No. 565. Water Environment Federation. 2014. Investigation into the Feasibility of a National Testing and Evaluation Program for Stormwater Products and Practices. A White Paper by the National Stormwater Testing and Evaluation of Products and Practices (STEPP) Workgroup Steering Committee. WEF, ASCE/EWRI. 2012. Design of Urban Stormwater Controls. WEF Manual of Practice No. 23, ASCE/EWRI Manuals and Reports on Engineering Practice No. 87. Prepared by the Design of Urban Stormwater Controls Task Forces of the Water Environment Federation and the American Society of Civil Engineers/Environmental & Water Resources Institute. Weiss, Peter T., John S. Gulliver, and Andrew J. Erickson. 2005. The Cost and Effectiveness of Stormwater Management Practices Final Report.. Published by: Minnesota Department of Transportation . Wossink, G. A. A., and Bill Hunt. 2003. The economics of structural stormwater BMPs in North Carolina. Water Resources Research Institute of the University of North Carolina. This page was last modified on 1 August 2018, at 15:31.